I have written extensively about Quarterback play already covering the intangible traits your quarterback must possess, the variables you must take into consideration when developing your quarterbacks, as well as some points to teach your quarterback to reduce his risks. Entwined in those writings has been a line of thought I’ve expounded upon in the past months which is the decision making process your quarterback will undertake. After the foundational article in this string, the first situation I expanded upon was the pre-snap decisions your quarterback must make and understand before your offense has a chance for success. Part of the process for the quarterback to understand what he is facing from the defense is a fundamental understanding of the perimeter to execute an option play. The quarterback must understand the possible reactions from the defense out of a variety of perimeter alignments. An aspect of this understanding is a simple acknowledgement of the numbers the defense has on the perimeter. These defenders are (The Option Man #2, The Run Support Defender #3, and the Near-Deep Defender, who is the man responsible for defending the playside wide receiver on a vertical release off the line of scrimmage.) In the case of 8-man fronts, the quarterback will also need to identify and understand how the play of the free safety fits into the defensive structure. We will start with 7-man fronts with soft corners; with varied alignments by #2. Let’s take the diagrams one by one. #2 Inside the Offensive Tackle – When #2 is inside the tackle, the Quarterback must expect a boxed defensive end (The DE will come up field to force a give to the B-Back, where the defense is trying to funnel the ball back to the linebackers). This may not be the play of the defense, but it’s a scheme that can and will be used. If you aren’t prepared for this adjustment, it could be the demise of your offense for that game. With the first diagram, you can assume it’s a 4-3 defense. in one form, or another. With the corner rolled off, the quarterback must be aware that either of the secondary players can become #3 when running Triple Option. There is no guarantee the safety will be #3. It’s will also be difficult for the defense to give you a 3-2 exchange unless the safety moves to inside 10 yards from the line of scrimmage. If he stays deeper than 10 yards it’s almost impossible for him to take the Quarterback and the Outside Linebacker to take the pitch. Other than Triple Option (12/13) this defense is giving away a soft edge. With this soft edge, you can expect fast flow from the Outside Linebacker, to any threat on the perimeter. If you are running Rocket Toss to this defense, its very important to get the ball pitched outside of the slot. Get the A-Back on the edge as quickly as possible. His threats will be coming from the inside. It will be hard for the defense to force the ball inside. With #2 aligned so tight to the offensive formation, it is not possible for him to play flat pass coverage. If you are throwing the ball, the defense will have to give you either Sky or Cloud coverage on the edge. Someone from the secondary has to be the flat player, since it’s impossible this player will come from the inside. #2 Outside the Offensive Tackle – With #2 aligned outside the offensive tackle, the probability of him becoming the Quarterback player on Triple Option increases. It will be more difficult for the defense to give you a variety of stunts from #1 and #2, unless #2 walks up near #1. We call this “being hipped”. With a hipped Outside Linebacker the chances of 1-2 games increase significantly. It’s also more likely the defense may play 3-2 games as well. #2 is in a better position to play the pitch. In this case #3 could more easily play the Quarterback when he creeps inside of 10 yards. There is no chance to play a 3-2 game with the corner. All 3-2 games will come from the safety only. In this scenario, similar to when #2 is inside the tackle, both the safety and corner can each be #3 by alignment alone. Note however that the closer the safety aligns to the line of scrimmage the more likely it is that he is #3 and the corner will be the NDD. The wider #2 aligns, the easier it is for the defense to put him into flat pass coverage. It is entirely possible that both secondary players could be playing deep (IE Quarters Coverage, or Cover-4) They can put the Outside Linebacker in the flat. If this is their scheme, the Mike Backer has to be available for Triple Option, meaning he has to be either the defender responsible for the B-Back or for the Quarterback. In this situation the defense is very vulnerable on the inside. #2 On the Line of Scrimmage – If the defense places #2 on the line of scrimmage, this is a much more aggressive alignment. There is far less possibility of a 1-2 stunt unless #2 aligns close to #1. In any situation the closer #1 and #2 align to each other the more possible and likely a dive read stunt occurs. With #2’s alignment the Quarterback must expect a quick pitch read, and quite possibly a pitch read in the backfield. 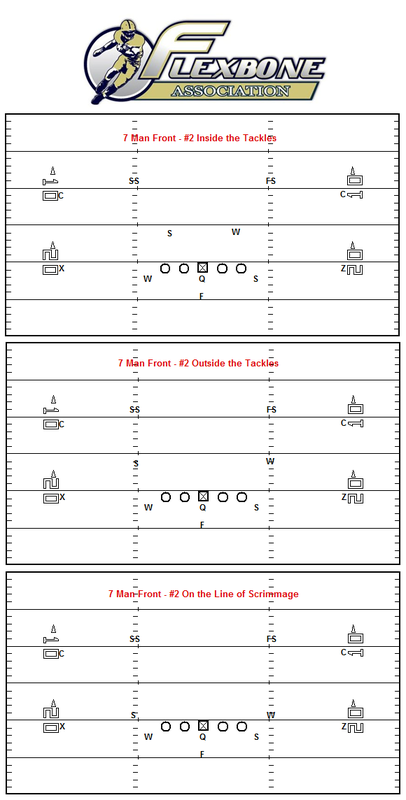 Triple Option responsibilities with #2 on the line of scrimmage become fairly defined. With #2 on the line of scrimmage, it virtually eliminates the possibility of a 3-2 exchange. If #2 is not aligned near #1, it’s fairly easy for the Quarterback to identify a definite 1-2 before the snap. In all scenarios with a soft corner, either secondary player can become #3, while the other player can become the NDD. Aligning #2 on the line of scrimmage, eliminates his being the flat defender when throwing the ball. Here again the Quarterback knows that the flat defender has to come from the secondary level. It also makes it easier for the defense to force the ball back inside unless you align in another formation such as Double Flex. Any Monster Alignment – In any Monster scenario the offense should check the play the other way. The defense will almost always line the other safety up in the middle of the field. This gives the offense a simple numbers advantage over the defense, if you run away from the Monster. Running to the Monster is possible, although not ideal. In a monster scenario, it’s most likely that he will be responsible for the flat in pass coverage, they will play Cover-3 behind him, and he will most likely be responsible for pitch against Triple Option. 3-2 exchange possibilities are highly likely. The other two basic defensive structures you can face, 7-Man Fronts with Hard Corners or 8-Man Fronts will not be a part of this article. With this article exploring each defense in explicit detail, I feel it’s too much to give it all away. This is the secret sauce, as one coach in Virginia called it, when we spoke on the phone a few weeks ago. The remainder of this series will only be available to Flexbone Association Academy clients. Signed agreements have already been rolling in. I look forward to working with you all this spring, summer and next fall. All of these situations must be practiced. There are no shortcuts to victory, unless you have a significant talent advantage over your opponents all season long. There is only so much a defense can do against a Flexbone team. If you and your staff have an established understanding of these defensive adjustments, what they can and cannot do out of each look, you will always be able to put your team in a position to overcome the opponent. Coach for your first diagram, when you talk about the DE being a box DE trying to funnel the ball back to the linebackers, my question is what is the best answer to this…Should the quarterback try and read the LB as #1 and pitch off the DE…should we assign our PST to that LB with and inside release so that LB has to defeat a block in order to make that tackle (but this leaves the other LB to possibly scrape over and tackle the dive)….